Figure 1: Spectral test apparatus at Biospherical Instruments. Biospherical Instruments maintains an apparatus for characterizing the spectral responsivity functions of filter radiometers (Figure 1). The device consists of a 1000 W xenon arc lamp and a 0.5 m grating double monochromator with a prism predisperser, designed and built by BSI (Bernhard et al. 2005). The two single monochromators that make up the double monochromator are stacked vertically and share a common shaft to which the gratings are mounted. This design ensures that the two single monochromators are always synchronized. Each of these is equipped with three gratings, machined with 2400, 1200, and 300 grooves per millimeter, for covering a wavelength range from 200–2000 nm. A low-pressure mercury lamp is used to check the wavelength accuracy of the system. A reference detector with a calibration traceable to the National Institute of Standards and Technology (NIST) is used to convert the raw data to calibrated measurements. By using an integrating sphere attachment at the exit port of the device, the spectral responsivity of radiance radiometers can be tested. 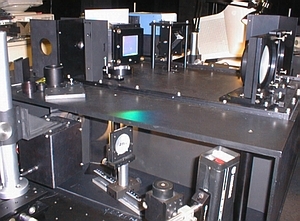 Figure 2: Irradiance collector of a GUV-511 radiometer that is illuminated by the spectral tester. 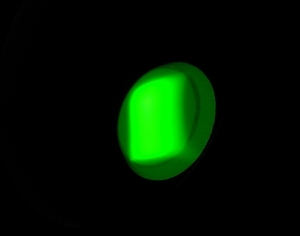 The wavelength was set to 555 nm.Figure 2 shows the cosine diffuser of a GUV-511 radiometer that is illuminated by the exit beam of the spectral tester. Bernhard, G., C.R. Booth, and J.C. Ehramjian. (2005). Real-time ultraviolet and column ozone from multichannel ultraviolet radiometers deployed in the National Science Foundation’s ultraviolet monitoring network. Optical Engineering, 44(4), 041011-1 – 041011-12.